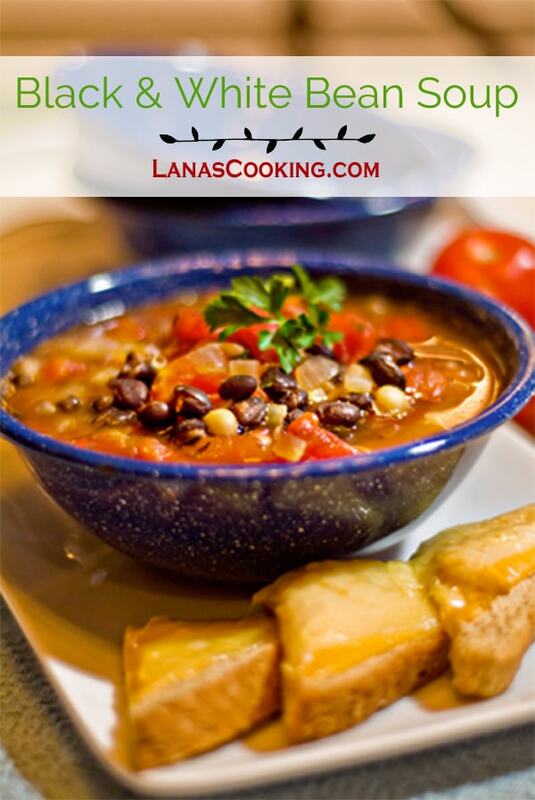 Black and White Bean Soup – Black and navy beans combined in a beefy, tomato broth for a substantial dinner soup. 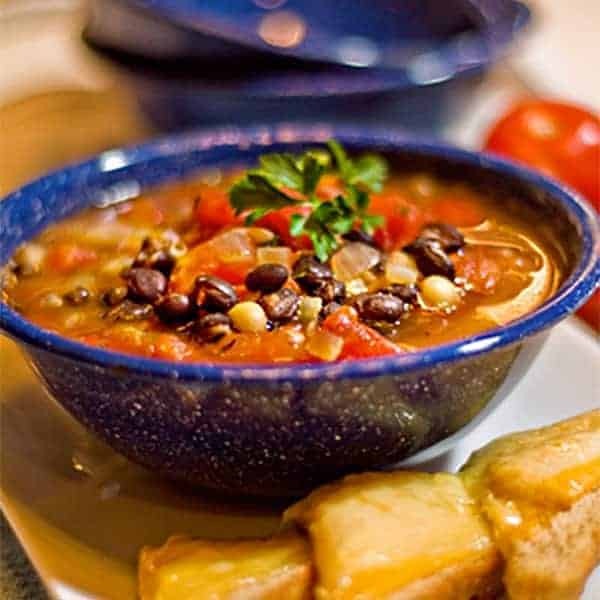 If it’s snowing or just plain cold where you are today, I’ve got a great Black and White Bean Soup recipe to warm you up. As you know, beans are low in saturated fat and sodium, and very low in cholesterol and a very good source of both protein and fiber. They’re also budget friendly. More so if you used the dried type, but honestly I rarely think far enough ahead to soak beans in advance. The canned ones work fine for me. A few days ago when it was dark and rainy and dreary, I started out to make some sort of bean soup and this is what I wound up with. A can of white beans, a can of black beans, some tomatoes and seasonings and we had a gorgeous pot of Black and White Bean Soup. Give this one a try. I think you’ll really enjoy it. Heat the olive oil in a large saucepan over medium heat. Add the onion and garlic, and saute about 4 or 5 minutes or until tender. Add the tomatoes, beans, beef broth, parsley, basil, salt and pepper and bring to a boil. Reduce heat and simmer 10 minutes. I served some simple cheese toast with this, but a nice crusty loaf of French bread or garlic bread would be great. Heck, just some saltine crackers would work for me! A quick and easy black and white bean soup. Great for cold evenings. Add onion and garlic, and saute 4 minutes or until tender. Add tomatoes, beans, beef broth, parsley, basil, salt and pepper and bring to a boil. Wow…looks colourful, nutritious and delicious. I need a bowl now to keep me warm! Boy this looks good on a cold wet day. How comforting. Do you think this soup would taste as well if made with vegetable broth rather than beef broth? I’d like to serve this but my soups need to be vegetarian. Suzanne – I think the vegetable broth would work. Give it a try and let me know what you think. This is my kind of soup-healthful and hearty! It doesn’t get better than that. Those beans look incredible & so attractive! Love the whole combo of them and your pic looks amazing too. Have a nice day! Wish you were next door and I could run over to borrow some baking soda or something and snag a bowl of this. Yum. Isn’t it amazing how much snowy weather the south has received this year? Weird! The soup looks marvelous and I bet is was delish! What a beautiful and comforting bowl of soup. Love how you served it! We never get snow here, but it can get cold! Why is it that bean soup always taste better to me then it sounds. Your picture looks delicious! I’m an incurable a bean soup junkie and look forward to trying this one. Many thanks for sharing this beautiful recipe. Wow, what a gorgeous photo. Love all the vibrant colors – way to chase away the cold! Thanks, Alta! I thought that photo turned pretty well myself. Hope you enjoy the recipe. Awesome recipe but I would substitute the beef broth with fresh chicken broth since I don’t eat beef. Thanks for this recipe! I needed a simple soup to accompany some cheese puffs, and this did the trick. It was great! I make bean soup with ham hocks,but this is so quick and easy. How long would this soup last in the fridge? I think it would probably last 2 to 3 days in the fridge. After looking at the sodium in all of the canned varieties of tomatoes, I couldn’t bring myself to use them for the soup. I used 5 or 6 fresh roma tomatoes and subbed veggie broth for beef broth. I am very happy with the result! Only problem some may have with the fresh tomatoes is that the skin comes off while boiling the soup. I just picked out the skins when I came across them. I suppose you could also peel the tomatoes before if its really an issue for you. Made this with 2 tablespoons of cilantro as well. Came out delicious. Served with grilled cheese. It’s about 70 degrees right now… and the low for us on Thursday is predicted to be 34 degrees. A bit of change in the weather, for sure. This sounds just right. I’m going to check my pantry for the ingredients!